I had an inspection, and was told that my snow shovel needs to be out of the reach of the children. She suggested I hang it on the side of the house with the handle down and the head up. I can just picture someone pulling it off of there and getting hit with the shovel in the head! That seems more dangerous to me than leaning it against the house on the porch. Any other suggestions? Mine are on a hook in the garage. Honestly otherwise short of a cabinet or high shelf I'm at a loss. Mine is kept on my porch. Leaned up against the railing. As far as I am concerned it IS out of reach of the children because children are never on my front porch without an adult. Mine are hanging in the garage, except for a plastic one I keep on the deck for quick cleanup. I'm with you though. I'd think it more dangerous for the shovel to fall down and hit somebody. 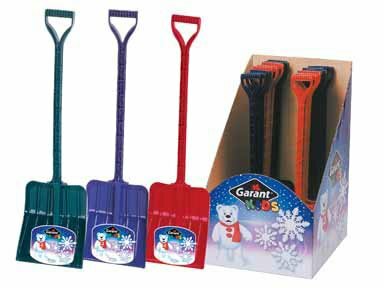 I mentioned this to my husband last night and he brought up a good point.... don't you have kid shovels for the kids? Why can the kids have access to them but not yours? I can totally see if you have the type that has a metal edge (sharp) or a metal shovel (heavy) but if you have the regular old plastic sidewalk shovels, they aren't much different than the ones I buy FOR the kids. Other than height, there isn't much difference between the two. I have mine right by the road in case a dcp is feeling helpful. lol JK It's only happened once in all my 30+ yrs. of providing care, that I had any dcp offer to shovel anything for me. Even the dcds who picked up with plows on their trucks. Anyways, I'll wait for the state to tell me to move it but mine is right outside my front door. Never even gave it a thought. I just wish we had a garage! Someday hopefully! After we pay off some debt, we plan on building a garage. I use the kid shovels to shovel. It sounds weird but I find them easier to handle! I keep a kid shovel leaning against my house. Did you ask to see the reg? But, it does state in part of the regs that "Outdoor play spaces, including areas under decks must be free from safety hazards including, but not limited to:lawn mowers, TOOLS, propane, gasoline, building scraps and scrap metal." Did she show you that rule in the regulations? Ahhh....A nice ambiguous rule open to individual interpretation. Apparently "no tools" means no adult tools - they can have shovels in the sandbox, right? Probably no adult trowels or hand cultivators to garden with, because heaven knows that children can't be taught how to use a tool safely with supervision.
. All I buy for sandbox toys are garden trowels and rakes because they're durable and good quality.